SIPs are thermal bridge free; choosing the right SIPs and following the manufacturer’s guidelines to build with SIPs can eliminate thermal bridges (or, at least, reduce them to a point at which their effect on the total building performance is minimal and can be ignored). The fact that they are pre-built and pre-cut according to the designer’s plan, in factory conditions, the margin for on-site errors will be significantly reduced. Since they are prefabricated in a controlled environment, the building process can continue despite adverse weather conditions, such as rain or snow. It is much faster to build with SIPs. On average, you can build the building envelope of a 2-storey town house within a couple of days. On-site waste management is virtually eliminated, saving time and money. 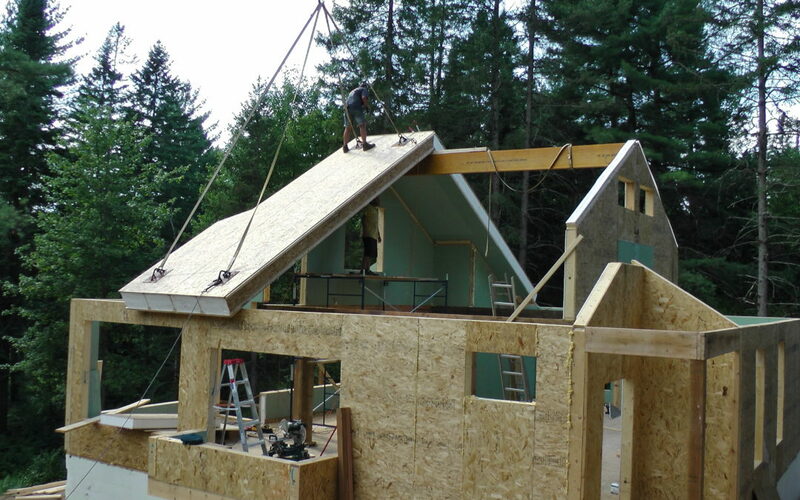 The environmental impact of SIPs is relatively low because SIPs can be repurposed and reused. It is a flexible solution; there is almost nothing that cannot be done with them. If you need more information about SIPs, please click here.